Pure Organic, BuddyFruit: The case against blended fruit snacks. 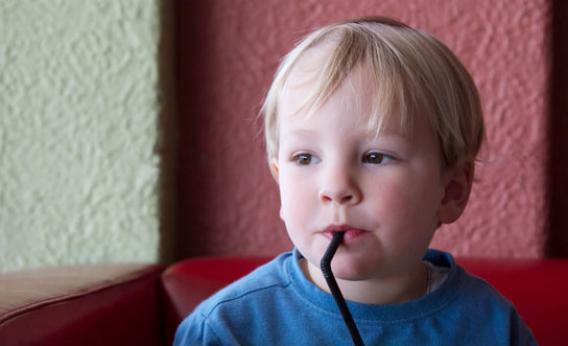 The case against giving your kids blended fruit and vegetable pouches. Nutritionists say pureed fruit pouches are not the equivalent of real fruit. My husband and I have a rule that we never, ever break when we leave the house with our 2-year-old: Bring. Loads Of. Snacks. I don’t care if he has just polished off four chicken fingers and a bowl of yogurt—chances are, our son will be hungry again within 14 minutes, and I better have something I can hand to him immediately or all kinds of screamy hell will ensue. Recently, I—and apparently a lot of other parents, too—have stumbled across a seemingly brilliant solution to this problem: spouted, blended fruit and vegetable pouches. (The annual revenue of Plum Organics, one of the first companies to sell these products, grew from $200,000 in 2008 to $39 million in 2011, according to Forbes.) Parents everywhere—including all-organic, anti-processed-food types—are raising tots who have plastic pouches growing out of their mouths, and can you blame them? The snacks are convenient; they’re virtually spill-free; they’re ubiquitous (on sale at Starbucks! ); and they’re pure blended fruit and vegetables, so we can feel good about giving them to our kids. Let’s start with the sugar. Most of these approximately 100 gram pouches—even some of the vegetable ones—contain between 12 grams and 20 grams of sugar, the equivalent of three to five teaspoons. Yet the same weight of raw peeled apples contains only about 10 grams of sugar; the sugar in this many raw strawberries adds up to only 4.9 grams. If a 90 gram pouch of BuddyFruit Apple & Strawberry Pure Blended Fruit is really pure blended apples and strawberries, then why, pray tell, does it contain 14 grams of sugar? In many cases—such as with the BuddyFruits and some of the Mash-Ups sold by Plum Organics—the answer is that the snacks also contain “concentrated fruit juice,” what the U.S. Department of Agriculture considers a fancy term for added sugar. (Plum Organics’ spokeswoman noted that fruit juice contributes less than one gram of sugar to its Mash-Ups, with the exception of the grape flavor, which gets a little less than half its 16 grams of sugar from grape juice concentrate.) Pouches made by other companies, such as Peter Rabbit Organics, do not mention fruit juice in their ingredient list, yet they contain far more sugar than the equivalent amount of whole raw fruit; this is probably because the company processes the fruit to remove the water, Nestle says, which concentrates its sugars. If you press all the water out of a grape, you’re left with a very sweet raisin. And this spike—particularly if it happens over and over again throughout your child’s life—can have a few unfortunate consequences. Meals and snacks that elicit large blood sugar increases are less filling than other snacks, in part because the big blood sugar boost is followed by a big blood sugar drop, which can make people feel starving even when they aren’t. (One 1977 study looked specifically at fruit and confirmed that people were less satiated after eating pureed apples than after eating the same weight of whole apples.) The upshot is that these snacks could induce your child to overeat. A 2003 study published in Pediatrics reported that children ate smaller lunches after eating breakfasts of Kellogg’s All-Bran, which elicited low blood sugar spikes, than they did when they had similarly caloric breakfasts of Coco Pops or white bread, which caused higher blood sugar spikes. The body also uses less energy to metabolize blended or processed food, giving it more net calories than the equivalent amount of whole food. Even if it doesn’t make your child gain weight, frequent blood sugar yo-yoing may still increase her risk for heart disease and stroke when she’s older. Fructose itself—particularly if it is frequently consumed in large quantities without any balancing fiber—has the potential to harm the liver, cause insulin resistance, and increase heart disease risk. So what’s a parent in need of infinite, easy, portable snacks to do? Let me reiterate: These pouches are not bad for kids every once and a while, and there are certainly far worse snacks out there. (Cadbury, Mars, Entenmann’s: I’m looking at you.) But when you want your child to eat fruit, consider giving her fruit. An apple, an orange, a banana—they provide less sugar and more fiber, less sticky sweetness and more satiety. Perhaps most importantly, chomping on real fruits and vegetables will help your child consider food the right way: not as something processed and sold in plastic pouches, but as something whole and from nature—seeds and skin and bruises and all.